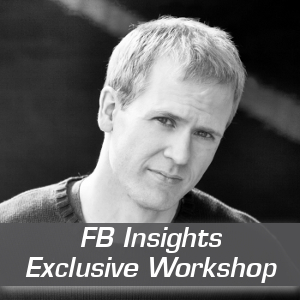 Master Facebook Insights in 30 Days! If the info in the webinar was too dense for you, here’s your chance to learn from me one-on-one and bring you up to speed in 30 days! There will be two webinars for this small group. In each one, we’ll tackle specific tasks associated with your Insights analysis. This will be hands-on training to help you master your metrics. Do you have an Insights strategy now? I’ll help you implement one. We’ll walk through your data together to determine what matters and put together an action plan to adjust your content accordingly. Every day you’ll receive an email from me with a specific lesson and task for you to perform. By the end of the month, you will master your metrics! As an added bonus, I will review your Facebook Page efforts at the end of the 30 days. This is the Silver version that generally goes for $97. All of that for $497. For perspective, my minimum monthly retainer fee is $2,500. Just think: In 30 days, you could have a much clearer sense of who your Fans are, what works and what doesn’t. What is mastery of your metrics worth to you?